Deanna, I really enjoyed reading your book Magick for the Elemental Witch. You include information from a rich and diverse history in this book. Tell us a little about your research process, if you will. I research on both the internet and in print books. The internet is so easy to access, however since anyone can post websites and information I always double-check anything I get from the web and see if I can find other sources to back it up or look to see what sources that website got their information from (such as from a book). I also use a wide variety of resources, as you can tell from my books I use references from a variety of religions so I might cite from Catholic, Buddhist, and Wiccan sites. What is your magickal background? I started back in college learning on my own by reading books, joining message boards, and through other internet sites. I also attended a few events held at a local pagan store. Then in 2009 an acquaintance I met through visiting and shopping in the store had started up a coven so I learned a more formal teaching through him and received a 3rd degree status. When he moved out of state my friend and I took over the group and have kept it going. You have several books out which are in-depth studies on their subject. How do you choose the subject of your books? The subjects are always things I am interested in or have recently learned about. Magick for the Kitchen Witch was really a learning process for me and I was typing as I was studied the topic for personal use. I am actually eager to re-do that title as I feel it was rudimentary knowledge because I was learning it as I was researching it. Magick for the Elemental Witch was a wonderful topic as I have always been interested in the four basic elements, and it was very exciting to read how other cultures and beliefs view those same concepts. Currently a couple of your books are in limited supply, but you have mentioned that you are re-releasing them. Are you self publishing? If so, can you tell us about that process? Magick for the Kitchen Witch and Magick for the Elemental Witch are in limited supply. I used a traditional, but very small, press at the time and since then they have stopped publishing books, so that’s why those titles are in limited supply. Recently my brother, who is also a writer, published through the Amazon press known as Create Space. I used it for my Tarot book, “365 Tarot Activities,” and really loved it! It was simple, the book looks amazing, and the book was ready in a week from the time I uploaded it. So, I will use Create Space for the re-releases of the witch books. It is a form of self-publishing which means I do a lot of self-promoting. You mentioned in a previous conversation that you are working on a book titled Magick for the Homesteading Witch. The title alone really excites me! Please, can you tell us what we can expect to find in that upcoming book? I am VERY excited for this title as well. I have put it on hold until I re-release Kitchen Witch and Elemental Witch, and then I will release Homesteading Witch. In it I go over the magickal correspondences of basic farm animals and household pets. Often times we see correspondences for exotic or wild animals; eagles, panthers, snakes…but we don’t usually get to interact with those animals. So, my title has chickens, cows, horses, sheep, etc. And, yes, there are magickal correspondences and deities attached to common or domesticated animals. I also go over pets like dogs, lizards, turtles, cats, guinea pigs, etc. The plant correspondences are common crops (corn, beans, potatoes); common household plants; and common garden herbs. I also include spells for common homestead items such as a blessing for a rain barrel, compost heap, or chopping wood. There is also a section on the sacred home and how each room or feature of a house can be considered sacred. I have not yet decided if I want to use Create Space or try a traditional publisher. My goal is to get with New Page or Llewellyn publishers. Thank you so much for your time, Deanna. Is there anything else that you would like to add for the readers? 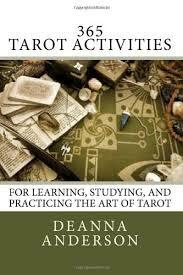 My newest titles is “365 Tarot Activities” and is available online. After I release “Magick for the Homesteading Witch” I will be working on the title “Magick for the Wild Witch” and it will be more geared to nature magick, camping, and hiking. I’d also like to add a big hearty thanks for all the support and positive comments I have received from my readers. It is an amazing feeling to accomplish my dream of being a published writer, so I thank everyone that helped me achieve that.